Over the years, many writers’ graves have become sites for adoring fans to offer their favorite scribes posthumous props. These tombs reveal as much about the writers, their lives and their works as they do about their legacies. If they had a choice at all, where did they choose their final resting place to be? Do the epitaphs suggest they died with their wits in tact? Do their remains have their own ghoulish, though worthwhile stories to tell? Upon her death from a heart attack in 1967, American wit, critic, poet, activist and all-around prolific human being Dorothy Parker left everything she had to Martin Luther King, Jr. When King was assassinated in 1968, her estate was passed on to the National Association for the Advancement of Colored People, and since 1988, her ashes have rested at NAACP headquarters in Baltimore, with an epitaph that reads, as she suggested, "Excuse my dust." Her remains originally sat in her lawyer’s filing cabinet after going unclaimed. Hitchhiker’s Guide to the Galaxy author and literary mad scientist Douglas Adams passed away in 2001 from a heart attack. Since, fans have celebrated the English author — whose headstone inscription simply reads "Writer" — by sticking a pen in the ground in front of his grave at Highgate Cemetery in London in reference to a passage in Hitchhiker’s Guide dedicated to "ballpoint life forms" that slip through wormholes when left unattended. Fans have also been known to pay tribute to Adams by leaving other items referenced in his writing, including towels. Woolf's ashes are buried beneath an elm tree at Monk's House in Sussex, England, where she lived with her husband. The house is now run by England's National Trust and serves as a major destination for Woolf fans. The late modernist is well served by her epitaph, which reads "Death is the enemy. Against you I will fling myself, unvanquished and unyielding o Death! The waves broke on the shore." She's perhaps worse served by that fairly creepy stone sculpture of her likeness. If you’re up on your Medieval Persian literature (and you are, aren’t you? ), you’re familiar with Rumi, the seminal 13th century Muslim scholar, mystic and peacenik famous for his six-book-spanning poem Masnavi. He died in what’s now modern Turkey, leaving the epitaph “When we are dead, seek not our tomb in the Earth, but find it in the hearts of men.” It seems that very few have heeded his advice. Famous in his time, Rumi was built a prominent mausoleum funded by the Georgian Queen Gürcü Hatun following his death in 1273. In 1926, the mausoleum became a museum that attracts millions yearly, especially during the annual 10-day Whirling Dervishes Festival held in his honor. Plath was buried at St.Thomas's Churchyard, Heptonstall, England, with an epitaph that reads "Even amidst fierce flames the golden lotus can be planted," slightly mistranslated from the 16th century Chinese folk novel Monkey by Wu Ch’Eng-Enby. The tombstone reads "Sylvia Plath Hughes" since she was married to Ted Hughes at the time of her death — however, several Plath fans have chiseled off Hughes’s name, believing that his adultery was one of the main reasons for Plath's suicide. Currently, the "Hughes" portion has been set in more chisel-proof bronze. Sci-fi pioneer and horror icon H. P. Lovecraft died in 1939 and was buried in a family monument. 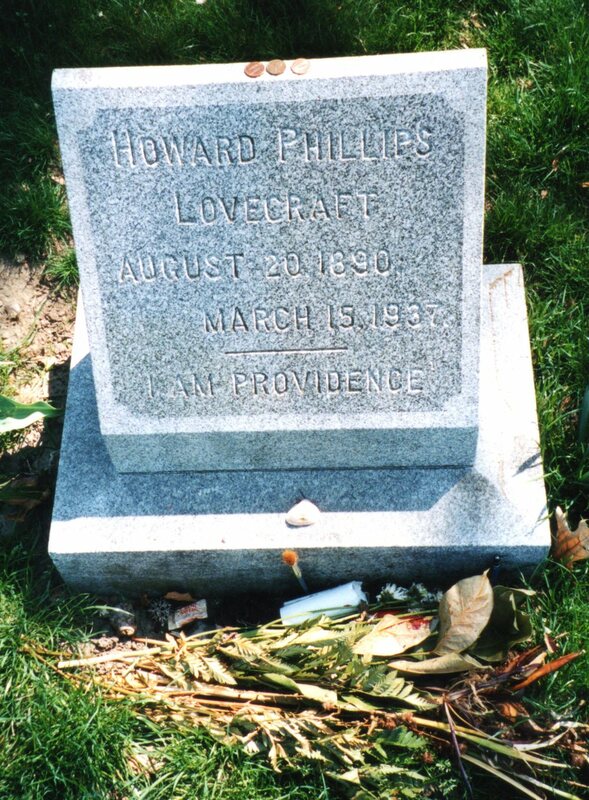 In 1977, however, fans raised money to purchase Lovecraft his own headstone at Swan Point Cemetery in Providence, Rhode Island, that bears the epitaph "I AM PROVIDENCE," taken from a correspondence in which the author emphasized his closeness to his hometown. In a yearly tradition, Lovecraft fans gathered at his gravesite on the anniversary of his death for "dramatic recitations, poetry readings and songs." Since 1998, the meeting has been held at Ladd Observatory of Brown University, one of Lovecraft's favorite local spots. One of the last poems ever written by Irish icon W. B. Yeats foresaw what most people past 70 probably foresee but usually don't feel like spending much time thinking about: impending death. Yeats frankly reflected on his mortality in his late works, and his last poem, Under Ben Bulben, envisioned what his grave would look like. He even mentioned a potential epitaph, "Cast a cold eye / On life, on death / Horseman, pass by! ", which is now engraved on his headstone in County Sligo, Ireland. The passage's meaning is widely debated. Poe’s death at 40 was famously mysterious, but here's what we know: It's been chalked up to everything from murder to suicide to meningitis to syphilis to a violent form of 19th century voter fraud called "cooping." It also may or may not have had anything to do with alcohol, which Poe may or may not have actually had a problem with. Originally, Poe was buried at Westminster Hall and Burying Ground in Baltimore without a headstone, then his body was placed beneath a much larger monument. Between 1949 and 2009, an infamous "Poe Toaster" celebrated the author by leaving cognac and roses on his grave on his birthday, January 19. Influential leftist Chinese novelist and essayist Lu Xun was a favorite of Mao Zedong, who made the writer an honorary member of the Communist Party after his death in 1936. (You can’t help but think that if Lu Xun was so inclined, he might have joined the party during his life.) Mao even made a calligraphic inscription on Lu Xun’s tomb, which was originally located at Wanguo Cemetery in the Shanghai suburbs but was eventually moved to Hongkou Park (renamed Lu Xun Park) in Shanghai in 1956. The park features a Lu Xun sculpture, as well as a museum and mausoleum in his honor. Wilde's tomb is perhaps the most popular destination in Paris's Père Lachaise Cemetery, which is also home to Gertrude Stein and Jim Morrison. Wilde's remains sit beneath a sculpture of a flying angel, which was crafted by the modernist Jacob Epstein. Folks famously smacked the stone sculpture with lipstick-heavy kisses until the practice was banned in 2011 for fear that the sculpture was eroding beyond repair. A glass barrier was since placed around the grave, which has gone on to become the new leading recipient of Wilde-fan lip locks. Did we miss any notable burial sites of novelists, poets and other writers? Let us know in the comments below.